The Bees and Blossoms cocktail takes advantage of winter citrus. Listen to Tammy talk about the ingredients and the surprise flavor. Bees and Blossoms sounds like it might be a drink for spring, but Tammy Coxen with Tammy’s Tastings says you can only get one of the ingredients during the winter. “One of the few things that I appreciate about winter is that we get this great influx of really interesting citrus fruits,” she said. While you can get lemons, limes, grapefruits and oranges the rest of the year, now is the time you can find blood oranges at your grocer. Some of the ingredients of the Bees and Blossoms. The red color of the blood orange really makes the cocktail appealing, but sometimes blood orange juice is not all that red. Tammy uses Peychaud’s bitters as a bit of insurance. Its bright pink color helps make the drink stand out and it also adds more flavor and some complexity. 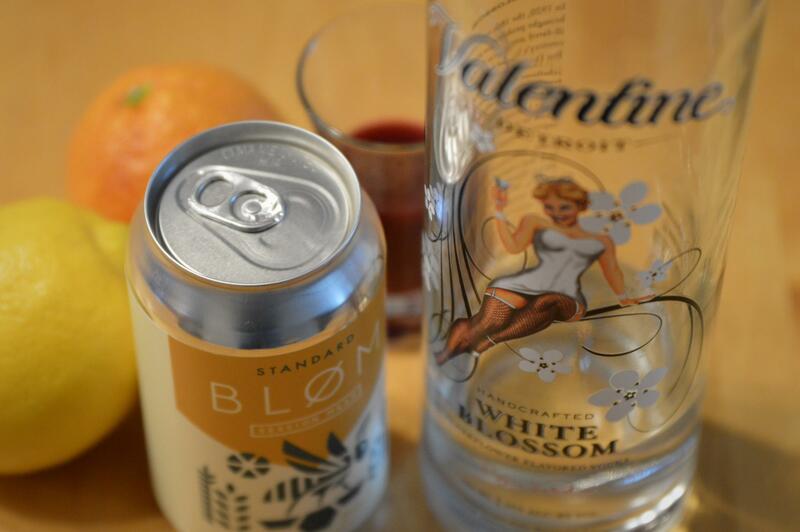 The blood orange might be a key ingredient in this cocktail, but its name comes from the elderflower flavored spirit, White Blossom Vodka from Valentine Distilling Company in Detroit (see our story about Valentine Distilling here) and the honey-derived Standard mead from Bløm Meadworks in Ann Arbor. This drink can fool some people. The elderflower and the lemon in the cocktail can suggest a completely different taste: grapefruit. Pour first four ingredients in to a shaking tin. Add ice and shake. Strain into a champagne flute. Top it off with the mead. Add a lemon twist.